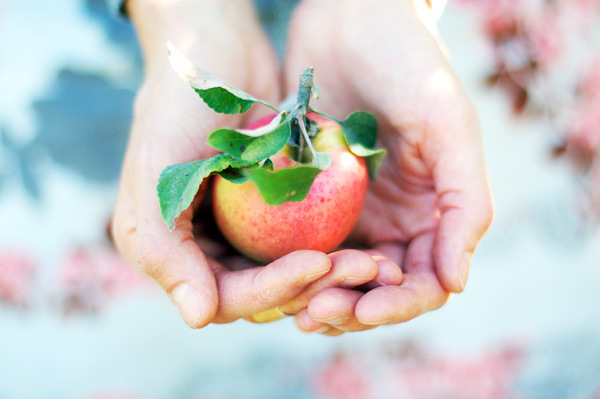 She was holding the small apple tight between her delicate hands. It was colored with beautiful shades of red, orange and yellow blending harmoniously. It was also perfect in size for her. She was casually leaning against P.’s chest but didn’t even seem to notice as she was too engrossed in observing the apple — her new treasure. Right. Left. Up. Down. And again, turning the apple with her fingers. Lulu seemed so happy, sitting on the grass between P.’s legs, that we simply wanted to stay quiet and watch, eager to prolong the moment. It was the first apple picked right from the tree that she was holding. 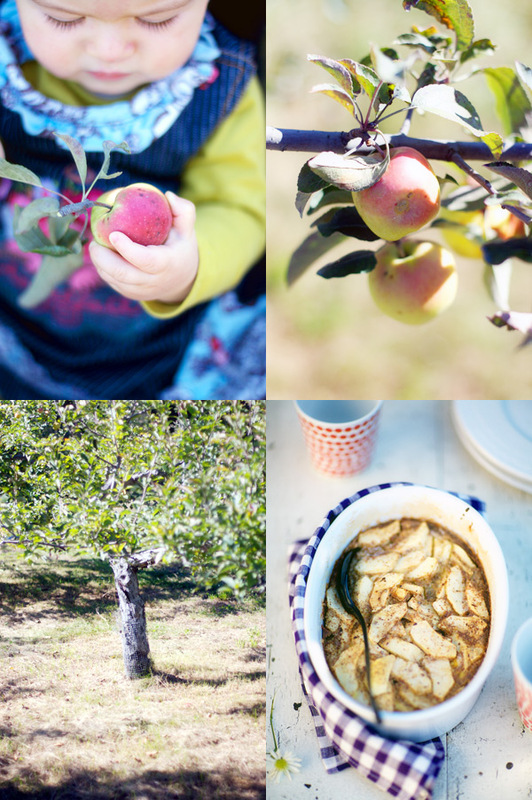 It was one of those perfect days in late September in New England, when the sky is blue, the light has a warming yellow hue and the air is crisp, and we had decided to drive to an organic farm forty minutes outside of Boston, to go apple picking. We hadn’t gone yet this year, so we were especially looking forward to the day. We wanted it special for Lulu. 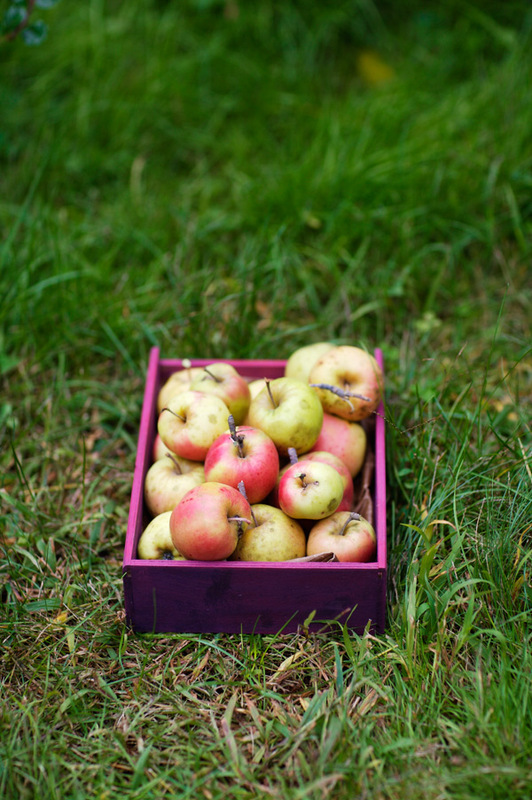 I wanted to bring apples home to make compote, tarts and clafoutis. There were still late summer raspberries and plenty of apples to pick and when we arrived, the place wasn’t too busy — I liked it that way. One family was eating a picnic under a tree with their one year old baby boy toddling hesitantly, which made Lulu very amused. We sat down on a large blanket next to them and ate our lunch. I had tossed together something quick but nourishing, a quinoa salad with cherry tomatoes, avocado and ricotta salata, and we finished with a piece of goat cheese, plain sheep milk yogurt — Lulu’s favorite — and oatmeal cookies. I carried Lulu on my back while we picked the fruit and, once our baskets were full with raspberries and apples, we sat down again in the shade of an apple tree. It’ll be peaceful, I thought. But I was far from imagining how pleasant it would be. “Tiens, prends la pomme,” (Take the apple) I told Lulu, holding a small red apple in front of her. She looked at it and then looked at me. Then she looked at P., as if to receive more reassurance. She paused and then smiled. Her eyes were lit with a spark that seemed to be smiling too. It was something special. She knew it. She reached for the apple and took it delicately between her hands and, while P. and I each ate an apple, she kept looking at hers, playing with it in her hands, bringing it to her mouth, feeling the texture of its soft skin against her lips, learning how to bite in it. It perhaps lasted for fifteen or twenty minutes. Surely more. She never let go of the apple. And later in the afternoon, when she fell asleep as we were driving home, she was still holding the apple tight in one hand. Back at the house, I baked apple clafoutis. And the next day, I stewed apples with spices that made the house smell like fallen leaves in the forest and September in early fall. 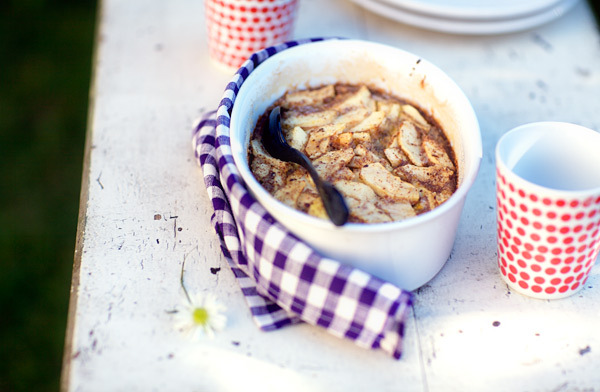 Note that in French, a clafoutis aux pommes (apple clafoutis) is often called a flognarde. And by the way, in case you wondered and were interested in knowing what i am cooking, you can follow me on Twitter here. I cannot believe I started! We’ll see what I do with it! Preheat the oven at 400 F. Butter a 7 x 9″ oven dish and coat its sides and bottom with sugar; set aside. In a bowl, combine the hazelnut flour with the cornstarch, cinnamon and sugar. In another bowl, whisk the eggs with the coconut milk and whole milk. Add the flours/sugar preparation and whisk until homogeneous. Pour into the dish and add the apple slices on top. Top with small pieces of butter and bake for 25 to 30 minutes. Serve the clafoutis lukewarm. Préchauffez le four à 200 C. Beurrez un plat mesurant 18 x 23 cm et saupoudrez-le de sucre; mettez de côté. Dans une jatte, mélangez la farine de noisettes avec la maïzena, la cannelle et le sucre. Dans une autre jatte, battez les oeufs avec le lait de coco et le lait. Ajoutez les farines et mélangez bien. Versez cette préparation dans le moule et répartissez les tranches de pomme dessus. Ajoutez des noisettes de beurre et enfournez pendant 25 à 30 minutes. Servez le clafoutis tiède. This is such a touching piece about your little girl. It sounds like you made her first apple outing very special indeed. And now you have beautiful photographs to remember the day…thanks for sharing. gosh she is precious. her bijou hands holding the miniature apple. (and that dress! and those tights!) 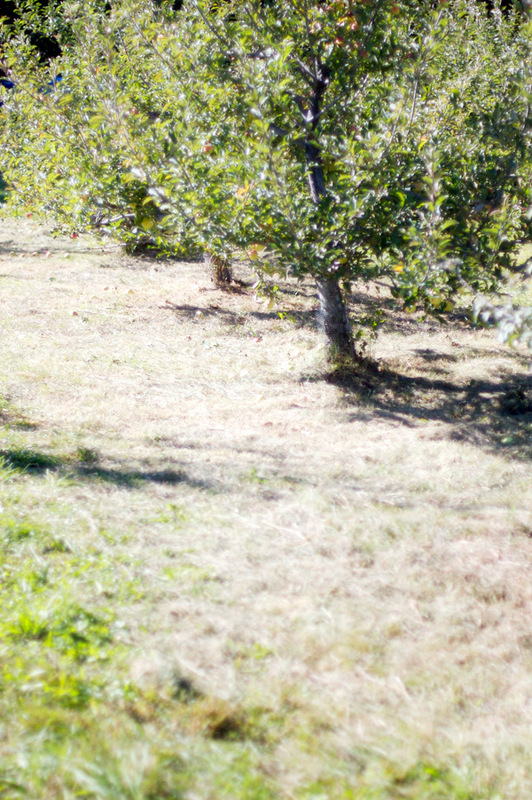 we went to the orchards last week, and even got some honey crisps, which was lucky, as those particular trees are usually stripped bare. i love apple sauce/ stew and spices. I can’t wait to make this with the apples I am picking tomorrow! Thank you for the recipe. Bea – your post never lets me down – beautiful and inspiring as always. Your Lulu is getting so big and so beautiful! What a lovely piece…I always love reading about autumn, especially on the east coast! Your little Lulu is becomes une jolie demoiselle. Love the picture of her staring at the apple. So precious! I meant “is becoming a jolie demoiselle” Lulu est tellement mignonne qu’elle me fait perdre mon Anglais! Ha! Pas plus haute que trois pommes, mais jolie comme un coeur cette petite Lulu ! Hi Bea – Your little Lulu is so adorable… both she and the little apple she is holding here have the same shade of rose! such a beautiful day you and your family had it must have been, and such a beautiful post you have here. Lulu is getting so big…. and of course, I love her dress! 🙂 she’s just way too stylish! we have baking with apples a lot too and the smells remind me of home. beautiful. Très joli billet, coloré et vivant. Ce clafoutis me remet en mémoire celui que j’avais fait l’an dernier (http://makanaibio.com/2008/11/clafoutis-pommes-pralin.html), et tu me donnes envie de faire un mix entre ta recette et la mienne, en utilisant notamment du lait de coco. Ca fait très envie, merci! Pas de farine de noisettes dispo en France, malheureusement. j’adore ces tranches de vie, tu décris à merveille l’émerveillement de Lulu qui m’a l’air autant à croquer que ces jolies pommes que tu décris! un vrai régal, de prendre (enifin!) le temps de te lire… et j’ai appris ainsi qu’il existait de la farine de noisettes, chose que je ne savais pas! Tellement adorable… J’aime tout dans ce billet ! So good to hear about Lulu and see pics of her too.. and she’s so cute and look so pretty.. such a darling in that pretty dress and oh my, those little chubby fingers.. enjoy her and the years to come..
Elle est a-do-rable (et ses habits sont extra!). Surtout la photo d’elle en train de regarder la pomme avec beaucoup de concentration. Such a beautiful post Bea, I could re-read it so many times.In just a few months, we’ll be able to do this with my little girl, I’m so excited I can’t wait. Béa, je ne suis pas sûre que vous puissiez recevoir ma réponse sur Twitter (je ne maîtrise pas bien ces twwets! ), donc je me permets de répéter ce que je vous y indiquais: si je ne me trompe pas (v. ce billet de Clotilde http://chocolateandzucchini.com/archives/2009/07/cherry_hazelnut_loaf_cake.php), la “flour” de noisettes n’est pas de la poudre de noisettes (laquelle est de la hazelnut meal), et la farine d’oléagineux n’est pas dispo en France. Mais peut-être est-ce de la poudre que vous avez utilisé également? She would be a perfect pomicultrice match for our 1 yr old pomiculteur:) Adorable!! 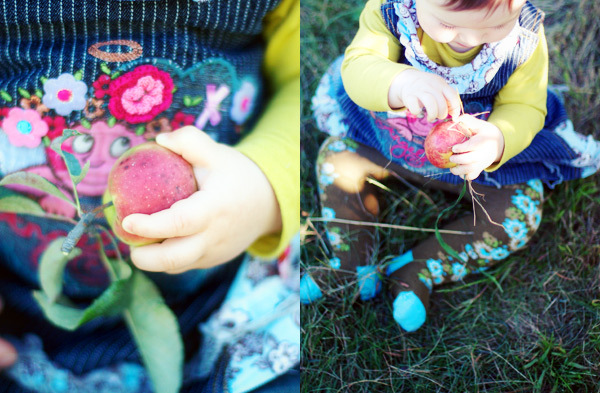 There’s something so sweet about babies and apples,pumpkins,flowers..just so perfect. Those are beautiful pictures. My grandma had apple trees and I was that little holding apples under her tree once. I love apple time. What an adorable baby! These are precious days for you and it shows in your photographs. Those cheeks are as lovely as fresh picked apples! The photos and story are beautiful, as always. I’m looking forward to getting my box of apples from the farmer’s market so I too can join in on the apple cooking/baking. recette avec du lait de coco….impossible de résister! Lulu est adorable! it is amazing to me how fast little ones grow. she is lovely and her holding the apple while she studies it is priceless. These kinds of simple pleasures and moments that you stop to savor are the best in life, I think! Lulu is lucky to have parents who take the time to appreciate and document these things to share with her later, unfortunately not all parents are that sensitive. Lulu is getting so beautiful and her dress is adorable! Apples are queens in our house. We go through bags and bags of them each week. Beautiful moment. I really can’t decide which looks more delicious – Lulu or the apples. What beautiful photos and your writing style is so open and genuine. I love it! Wonderful recipe as well. Wonderful! I envy you folks who get to visit an apple farm which is nonexistent here. Lulu is really precious and those little floral tights are so cute! Yes, the smell of stewed apples is delicious and cozy. Looks like you all had such a wonderful day. Oh Bea, Lulu is soooo cute, holding an apple in her little fingers! Атф she looks like you very much! I also madу an apple and hazelnut clafoutis some days ago. I add some cardamom to it and the taste was just perfect! Aw she is precious as she is beautiful. What a poppet. 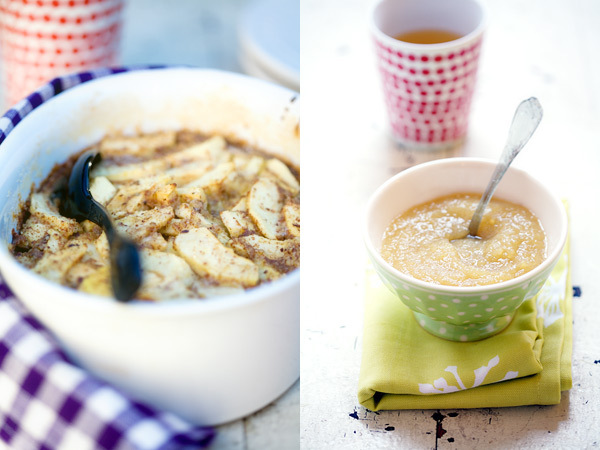 A beautiful tale of pommes, and a heart warming clafoutis. Made my day smile looking at her little hands clutching the fruit! huuum je ne connaissais pas mais cette recette a l’air superbe! such beautiful + inspiring photos! Quel beau billet, nous on a fait la cueilette au verger avec nos Loulous de deux ans le week end dernier…un vrai bonheur…comme ce clafoutis!! Too cute! Bea, I posted a third painting I did from your photos – it’s my favorite one. I’ve been watching your blog for quite a while now. I think it’s been over a year, but I never felt the need to comment. I just want to thank you for the wonderful stories and the inspiration. This post has something magical. Lulu is incredible, I can’t believe how quickly she grew. She’s been a ray of sunshine in your life, and I can feel it in every word you write here. I’m becoming more fond of the stories about her, than about the recipes or the incredible photography, the reasons why I kept coming back here in the first place. Thank you for sharing all the little miracles in your life with us! Your precious daughter is adorable!…Your posts always make me smile! 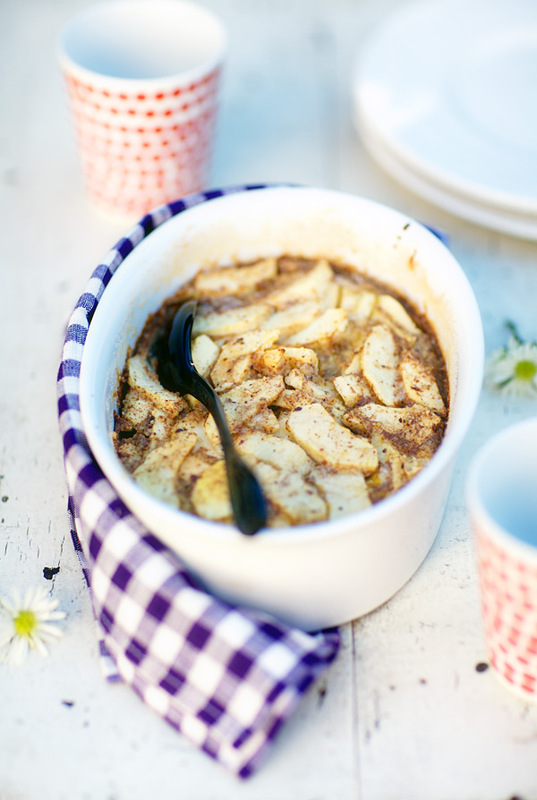 I have tried many of your apple recipes and I am always thrilled with the result! Thank you again. Your little Lulu is so precious and cute. Thanks for bringing me back in memories of the same moments I passed with my little V.
You have almost made me homesick for my former home. 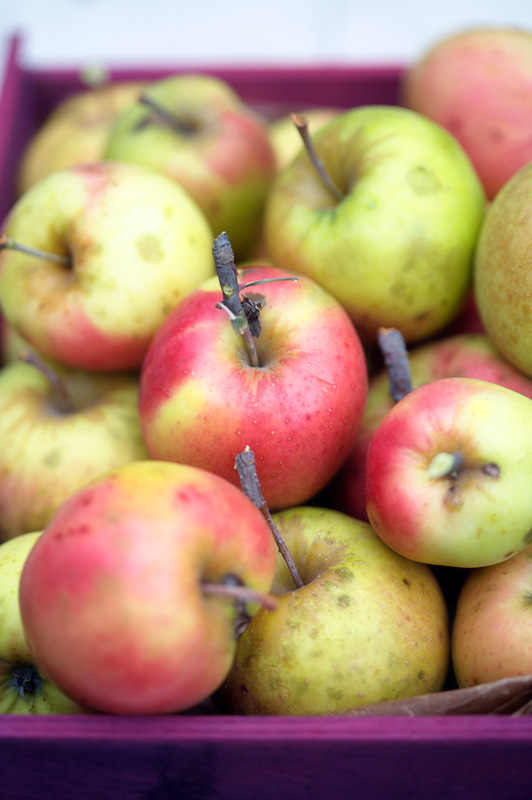 I loved apple picking in the towns around Boston. 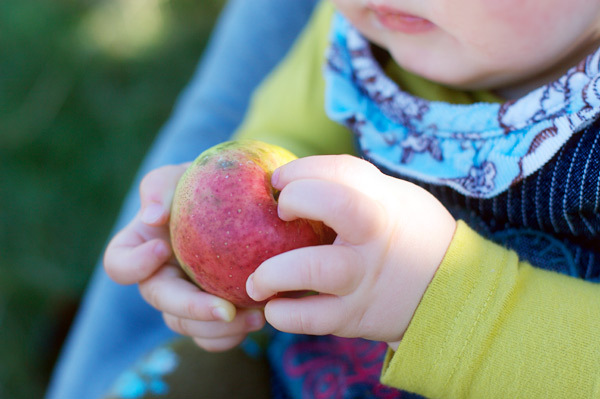 I think I was as fascinated as your gorgeous Lulu the first time I went apple picking – as a full grown adult! I will always remember that day. Not a common thing to do here in sub-tropical Brisbane! Banana picking, yes. Apple picking, no. I wish I had all your delightful recipes on hand back then to use up my bags upon bags of apples I would pick each year. The hands holding the apple make it look so inviting. Gorgeous! I love your food pic so much.,and I find a blog web have a lot of pic as the same as yours. I don’t kown she or not copy your pic. you can go to see it. Hey! I have a rather proficient understanding in Chinese and I’ve read the Chinese blog who copied most of your text wholesale. I’m deeply disgusted by the behaviour of that individual. If possible, I strongly encourage that you seek legal action against her. However, the disrespectful pirating behaviour of this individual is not something new in the Chinese blogging sphere, and has happened to many individuals I believe. As a Chinese myself I am deeply shameful of the actions of that individual and would like to apologise on her behalf: We are sorry! On another thought, I think it would go down much better with her, if we are incapable of stopping it completely, to see if you would like to liase with her to be the official poster of entries in Chinese. That way you could actually reach a wider audience? Hope all this helps. Bon courage ma madame! PS I wonder…do you have a cookbook?? Your work just seems as though it would be perfect for print. You’re an Artist! It is just such a bliss to read words of happiness, of love, of beauty. Your words are more than those of a mom, more than those of care. They are those that a painter would word on his canvas, those that a musician would word in his songs, those that a poet would put together to create a masterpiece. And you are a poet yourself. I felt I was reading a book, and one of the best. I could see the lighting and feel the wind and temperature, hear nature and human life and picture the smiles as I was reading you. I’m glad and I was just so pleased to discover that cooking and photography are definitely not your only art skills, and I would just love to read a book of yours if ever you write one. Life is good! I am coming up to boston this weekend for the head of the charles and was wondering if you could recommend some good restaurants?? thanks! Oh yum! Talk about ultimate comfort. So what happen to that apple? Thank you everyone for your notes! Baptiste, merci beaucoup! I just discovered your site, and I’ve fallen in love with it. I’ve never baked a clafoutis, but recently I made a trip to eastern Washington state and returned with a load of fresh apples, so I’m looking forward to this wonderful dish. Thank you for sharing. De rien Béa, c’était sincère. Pour ceux qui vivent en France qui cherchent de la farine de noisette, je me rappelle que j’en trouvais habituellement dans les magasins d’alimentation biologique. Ils ont souvent des produits un peu plus atypiques ou plus difficiles à trouver ailleurs. You are so fortunate to be able to document, so exceptionally well, in photos, and words, the incredibly beauty and poignancy of your sweet baby girl’s days. What a gift to Lulu! This is just a lovely post, like all your others. je suis totalement sous le charme de ce clafoutis !!!!!!! This is such a gorgeous site. Thank you for sharing this beautiful story about your daughter. Lovely clafoutis recipe. Merci! I am working every day on my own blog at http://icooktheworld.wordpress.com and I understand how such a project is a true labor of love. What a compliment to you that so many people are active participants on your blog. I am certainly going to be one. question: isn’t a clafouti made with a fruit other than cherry called a flognarde? Have you ever doubled this recipe? I’m thinking of making this for Thanksgiving. Paula, sorry I never got back in touch to reply. I have not doubled the recipe but that’s totally fine to do! This is such a gorgeous recipe. Made it yesterday as a dessert for our independence day meal. Oh how I love clafoutis!